Spice mobile has just launched another smartphone with impressive specs at a Budget Price, the Smart Flo Pace 3 Mi502n. Although that handset lacks the 3G connectivity.Before launching this handset the Spice Mi-550 Pinnacle was announced that comes with a Stylus, a Rival of Micromax Canvas Doodle 2 A240. The handset comes with 5inch display, DUAL SIM card slots and Android 4.2 Jelly bean OS. Spice Mi-502n has 1.3GHz dual core processor paired with 512MB of RAM. There is 8-meagpixel camera with dual LED flash at the back and 1.3MP camera at the front of device. Talking about the connectivity options it attributes 2G, EDGE, GPRS, Bluetooth, WiFi, micro USB and houses 21oomAh battery. 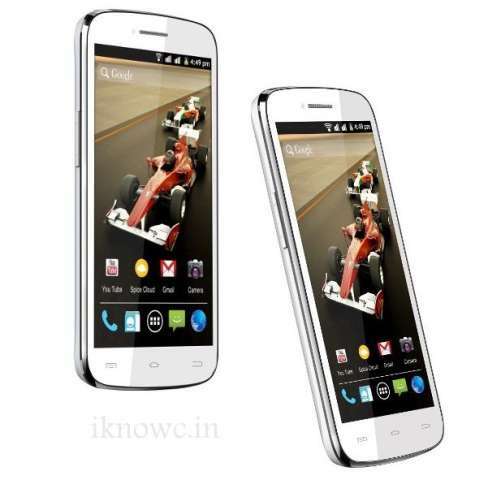 The Price of Mi-502n Smart Flo Pace 3 is RS.7499 and it comes in two colors, White and Blue. The specifications are quite fair if we left the 3G feature and low ROM. But if you are habitual of 3G network then better to avoid this one.